I just preordered this bad boy from EE.... gotta say, I'm pretty excited about it. Looks great, still not to keen on them already revisiting a character but I think this rendition looks amazing. I've got mixed emotions about this guy... the sculpt looks okay, I'm anxious to see it with some color and would really like to see it next to some others for a size reference. 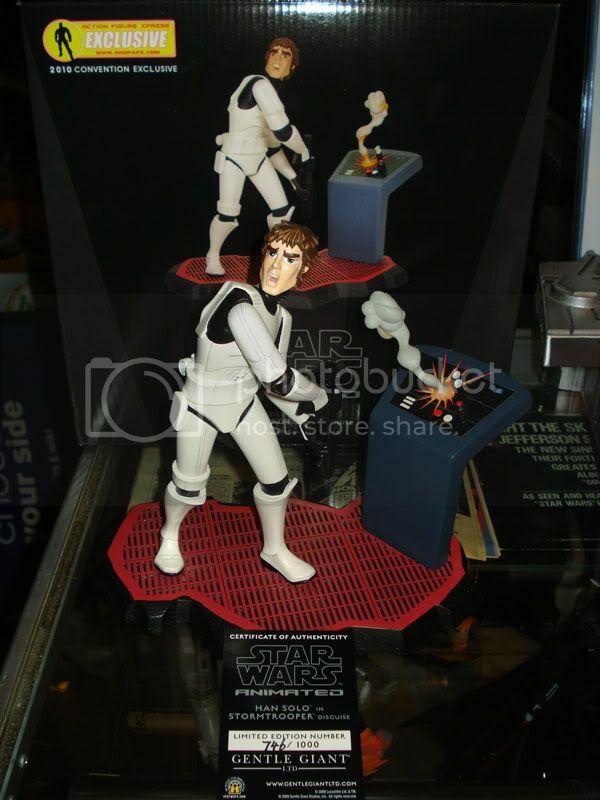 This is an AFX exclusive... goes well with the previous one (Luke Stormtrooper) but again, I'm disappointed to see another character revisited. I'm itching for more variety of faces. Such a wide range of characters not covered yet. Oh well... this one will look great alongside all the others. 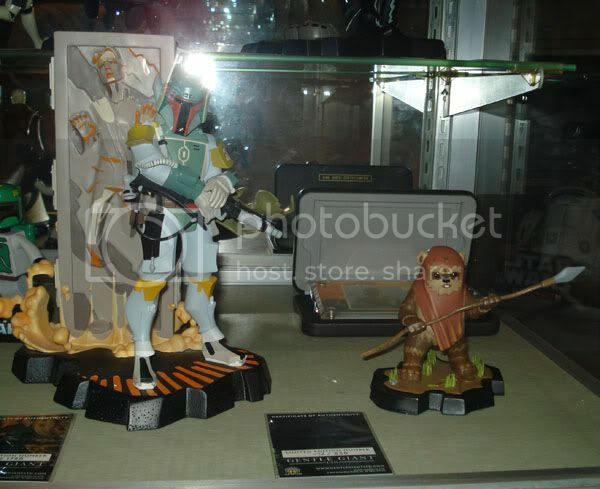 The Clone Wars White Clone Trooper maquette is expected to be released early May. Niktom, the Boba Fett with Han Carbonite will be available at other retailers and you will probably be able to save $10-20, EE is really expensive. SpecialOpsUnit wrote: Niktom, the Boba Fett with Han Carbonite will be available at other retailers and you will probably be able to save $10-20, EE is really expensive. Really? I was under the impression it was an EE Exclusive, at least that's the way they are advertising it. Which other retailers are saying they will have it? 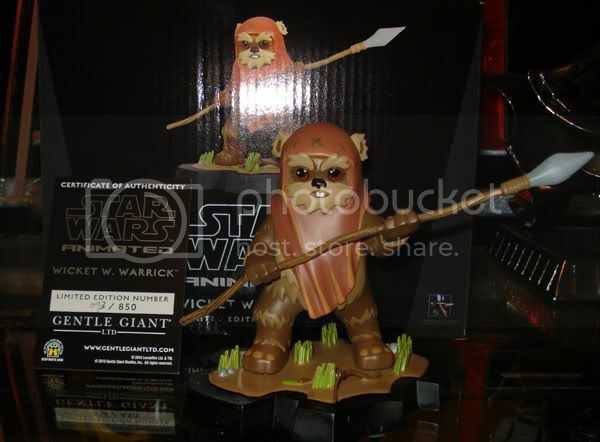 Wicket the Ewok gets the animated treatment in this stylized poly-stone statue. First seen in Return of the Jedi, Wicket befriends Princess Leia Organa and helps the rebel alliance defend the forest moon of Endor from the attacking imperial forces. Strictly limited, painted and ready to display, Wicket stands 4.5 inches tall and is in scale with all of Gentle Giant's animated Star Wars maquettes. Hand numbered with matching certificate of authenticity. Also... they are offering 1 cent shipping! Well... GG is killing me with this lag in production... but I finally got the Boba and Han. I must say... this is by far the best on yet. The posture of Fett, the coloration, the animated design of Han... all spot on. This pup is a beauty and the picture does not do it justice. Highly recommended! Thanks to a tip from Mike (mercuryartstudios), BBTS has put the Slave Leia Animated Maquette for preorder on their site. If you do order from them, tell them that Yakface sent you. WooWhoo... got that pretty lady preordered! Oh man, no matter what, Slave Leia looks hot in any form! Sweet! FINALLY! After I don't know how many delays... Wicket has arrived. He's small... but looks fantastic. The coloration is really good, much better than the promo shot in my opinion. Very low production number at 850. Makes me really think this line may be on the way out. Here's a shot in the case to size comparison. My need to move him by the Yoda/R2 so that he's now dwarfed. I may be looking for someone to try snagging one of these for me at a con. Just wonder how AFX will handle their 100. Hot Dog, Hot Dog, Hot Diggity Dog!!! Looky what showed up at my door today! Great piece.... looks awesome sitting next to the AFX Luke in Stormy. Not bad for a SDCC/CV exclusive that I didn't have to go get or pay a scalpers premium for. The good news is that you can still get one! By far though.... one of my favorites of the whole line. Well worth the wait and money! Well it's only two months shy of a year for posting to this thread. Guess that kind of speaks volumes for the condition of this line. I'm sad to see the Original Trilogy of this line coming to a near stand still... and yet I'm relieved for the break. I really like them (the craftsmanship is top-notch and they all look fantastic displayed together) but as my collecting interests have really changed over the past several months it's becoming more difficult to justify spending cash on these. However, my OCD for these seems to be winning out.... sooooo, here's is the latest pre-order. Can't say I'm overly excited about the choice in character... I could think of many others I would prefer. However, the execution looks fantastic.... assuming the final product comes in looking this good. Estimated ship date is Feb 2012.... looking back over this thread, I'm hoping to see it by mid summer. Yeah, a bit of an odd choice picking a character with so little screen time. But Boushh does look pretty cool to me. I have the first animated Boba and Princess Leia and they'll do fine for me now. And here I thought Slave Trade was illegal. That darn Boba Fett is the one that got me hooked on these things. Picked him up at a near by comic book shop. Hadn't even known he was coming out. Was like... "oooooh, I need that to go with all my other Fett stuff". If I had only known.